Christmas may be over, but for us the season of enjoying delicious food never ends. We love the mix of gastronomy Cornwall has to offer; however during January, it is often hard to find restaurants open as many close for refurbishment or a well-earned break. We’ve compiled a list of some of our favourite restaurants which remain open for business to help keep the winter blues at bay. We couldn’t leave Jamie Oliver’s Fifteen Cornwall at Watergate Bay off our list. After all, it is one of Cornwall’s most famous dining hotspots. Fifteen’s culinary ethos is clear; to create dishes using locally sourced and produced ingredients. Head Chef Andy Appleton brings the flavours of Italy to Cornwall through an array of Mediterranean-inspired dishes prepared in a Josper charcoal-fired oven. The tasting menu has been designed for a whole table to share. It includes five courses for £60 per person or seven courses for £80 per person. Wine pairing is an additional £45 per person for five courses or £60 per person for seven courses. Make a beeline for the antipasti bar if you’re in the mood for a light bite. Positioned alongside Fowey’s waterfront, our renowned Q Restaurant offers a menu carefully crafted by head chef Ben Bass. Since rejoining us in October 2013, Ben has completely revived The Old Quay House’s menu, with an emphasis on seasonal dishes, making the most of the bounty of local produce on our doorstep. Join us for duck confit, local scallops and a pina colada mousse – are your taste buds zinging yet? 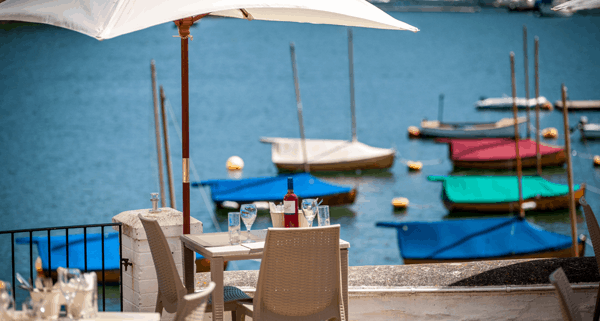 We also offer an extensive hand-picked wine list so you can enjoy Fowey Estuary’s colourful waterside life with a glass in hand. Set along the beautiful Carlyon Bay, Austell’s was awarded, and has maintained, 2 AA rosettes for Culinary Excellence since 2008. Head chef Brett Camborne-Paynter’s culinary repertoire includes The Ivy, The Waldorf and The Four Seasons with Jean Christophe Novelli. Austell’s cooking style is best described as modern British dishes with subtle Mediterranean touches. We especially love their Sunday pot luck menu which features dishes including Cornish pigeon breast, poached potato gnocchi and caramelised lemon tart. If you love seafood as much as we do, then we’d definitely recommend a visit to Rick Stein’s Seafood Restaurant in the fishing port of Padstow. Rick Stein is famed for creating imaginative dishes which are inspired by his own travels. Head chef Stephane Delourme and his team have developed a menu which majors on fresh oysters and langoustines, mussels, turbot, dover sole, lobster and sashimi. The Seafood Restaurant also hosts charity lunches in aid of Save the Children. Last year they raised over £10,000 for the charity. This year’s lunches will run from Wednesday 15th January to Sunday 9th February 2014 (excludes 18th January 2014), where you can enjoy a three-course lunch for £18 with a £2.50 cover charge donated directly to Save the Children. Sample dishes include fish and shellfish soup with rouille and parmesan, Newlyn fish pie and chocolate tart with seville orange sorbet. Tickets are now sold out, but seating will be available at the bar each day. Sam’s is a family business and a much loved group of fashionable restaurants throughout Cornwall. Sam’s started life as a 60s-inspired lounge/bistro in Fowey, but has expanded to a beachside restaurant in Polkerris (temporarily closed between January 12th – 31st) and a cool city bistro in Truro. Sam’s on the Beach is just a coastal walk away from us, and occupies a former lifeboat house on the water’s edge. Far-reaching views of the harbour and St Austell bay beyond make it a truly unique destination. Sams’ newest opening in Truro is an extension of its fun and flirty personality, complete with a Champagne bar, funky memorabilia and music. We love its fun twist on traditional dishes: expect rustic yet beautifully presented food served by the platter. We recommend the sharing Seafood Feast Deluxe for £41.95, which includes pan-seared garlic scallops, red thai mullet, calamari, and moules marinière.